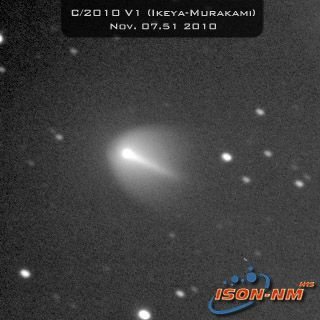 Comet Ikeya-Murakami (C/2010 V1) appears to brightening, signifying it could be in the middle of an outburst. Furthermore, the comet's gaseous head or "coma" bears a striking resemblance to that of Comet Holmes, which experienced a dramatic brightening and explosion in 2007. A newly discovered comet that has caught the attention ofskywatchers around the world appears to be undergoing some dynamic changes. Russian astronomer Leonid Elenin, of Moscow, used theremotely operated ISON-NM telescope in New Mexico to observe the new CometIkeya-Murakami over the weekend. "After the discovery, C/2010 V1 looked like a brightfuzzy ball, without details," Elenin told SPACE.com in an e-mail. "Butafter a few days, I was discouraged - [this] comet is rapidly changing." The comet appears to brightening, signifying it could be inthe middle of an outburst, according to Spaceweather.com. While the cometcannot be seen with the unaided eye, it should be easily detectable with backyardtelescopes, the website added. Typically, however, finding a comet with atelescope can be tricky for those who are not familiar with sky charts and thenight sky. Elenin said that in follow-up observations, the outer coma -the envelope of gas and dust at the head of the comet - had disappeared. "But I saw an excellent inner coma, which looks likethe mini-version of the 17P/Holmes comet after its powerful outburst in2007," Elenin said. "Also we can see bright and sufficiently long tail." Comet 17P/Holmeswas a small and very faint comet that overnight, in October 2007, became brightenough to see with the unaided eye. The comet, which was discovered in Nov.1892, surprised astronomers with its unexpected outburst, and what triggeredthe brightening is still not well understood. Skywatcher Gregg Ruppel, from Ellisville, Mo., also recalledseeing the comet brighten in his own examinations. "I learned of the comet shortly after its discovery andwas up early in the morning to image CometHartley 2," Ruppel told SPACE.com in an e-mail. "The new cometrose just before sunrise and was immersed in the light pollution and haze tothe east of my backyard observatory." "But when I positioned my astrograph to the expectedlocation, there it was," he explained. "At first I wasn't sure if itwas a tail because I tracked the comet and the stars appear trailed. But itdoes seem to be in outburst mode as it brightened considerably over just a fewdays." Comet Ikeya-Murakami (C/2010 V1) has been visible near thebrilliant ringed planet Saturn in recent days. The comet and Saturn shine bright in a Nov. 5 photo taken byItalian skywatchers Luca Buzzi and Andrea Aletti of the G.V. SchiaparelliAstronomical Observatory just north of Varese, Italy. "Iwas excited when I knew about this bright amateur discovery. I was right in myobservatory, doing my routine minor planets follow-up, and I hoped the skyremained clear to catch the comet a few hours later," Buzzi toldSPACE.com. "It's good that in this modern era, dominates by the bigsurveys, there is space left also for amateurs discoveries." SPACE.com Managing Editor Tariq Malik contributed to thisreport.